Moving in to fill the space once carved out between country and alternative rock by alt-country pioneers such as Uncle Tupelo and the Old 97’s, three sons of University of Virginia Southern Literature professor Bill Wilson and two other willing accomplices come together to form the Charlottesville-based Sons of Bill under the charge to help revitalize a discipline that in many respects has become forgotten in country’s subgenre landscape, and has shed bands and listeners to the more fashionable nomenclature of the day—Americana. 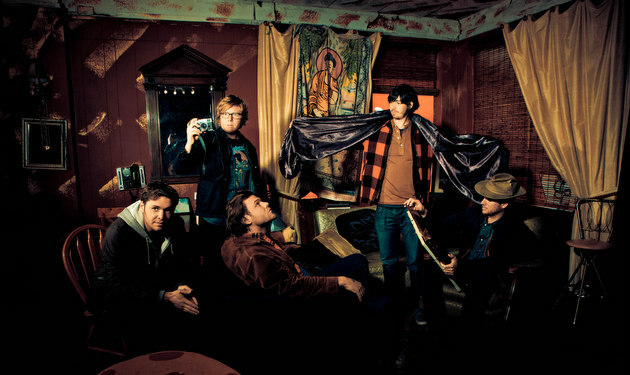 But Sons of Bill are still very much an alt-country band at heart, even if they have to adopt the ‘Americana’ term to save themselves from lengthy explanations. Admittedly ‘alt-country’ sounds a little bit tired as a term these days, and in some listener’s minds it evokes ideas of graying musicians who were hot in the mid 90’s trying to hold on to what was cool 20 years ago. 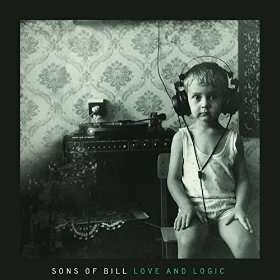 But Sons of Bill is very much a band of now, and if it accomplishes nothing else, their new album Love and Logic is an example of this, and poses a challenging and expansive approach to composition and songwriting that the whole “three chords and the truth” of country simply doesn’t have the capacity to encapsulate. In fact Love and Logic reaches further into the rock zone than even the alt-country designate traditionally affords, almost like indie rock with steel guitar in certain spots, with old-school Brit pop sensibilities in the form of answering chorus lines and keyboard sounds spread throughout this album. The full gamut of the Sons of Bill’s influences are on display here, from Townes Van Zandt and Gram Parsons, to R.E.M. and The Replacements. Merle and Hank are here too, but you’ll have to listen a little bit deeper to hear their legacy in the bones of these compositions. Love and Logic is a very brooding, ethereal, almost spacey experience, with not a lot of pace to the music, but more of an immersive approach to enrapturing the listener and pulling the emotion out of them through the combination of sonic landscapes and literature set to music. Where the more universal appeal for Sons of Bill can be found is in their songwriting. Love and Logic is smart and self-aware, and assumes an attentive and adept listener. They’re not afraid to unburden their fears or to offer their opinions through song, and this affords the same opportunity for the audience. The song “Brand New Paradigm” chimes the warning that can’t be heard enough about slowing one’s self down to let the rat race proceed without you. “Bad Dancer” iterates the dilemma of the brooding male like few others accomplish. “Arms of the Landslide” speaks to the overwhelming nature of simply being alive these days and being willing to submit yourself to a path that is inherently uncontrollable. Though the sounds and approaches are new, there’s a lot of unapologetic 90’s influences flowing out from Love & Logic, especially in songs like “Arms of the Landslide” and “Brand New Paradigm.” But the old-school country influences come poking through too, like in the simple and warm approach to “Fishing Song.” Even when you feel they’ve reached well outside the realm of country, a banjo strike, the moan of a steel guitar, or a three part harmony grounds the Sons of Bill to those moments when brothers Sam, James, and Abe Wilson were being raised in a house where their father played traditional country music for the family. Producer Ken Coomer, who played drums in both Uncle Tupelo and Wilco, and has produced albums for Steve Earle, Emmylou Harris, and Will Hoge to name a few, feels like he wields a heavy hand on what Love and Logic resulted in. Some may wince at the sedated nature, or the compositional Wilco-like approach of this album, while others may wonder just what exactly is country about it. But Love and Logic is worth giving a chance and trying to discover its beauty even if it initially hits outside one’s initial comfort zone. Loved their past releases, really looking forward to hearing this. 3 chords and the truth? If you REALLY want to tell the truth, you have to stick with one chord that uses 3 fingers or less… Why show off? You know if Wililie was looking for some fresh material I could easily hear him doing “Lost in the Cosmos” or “Higher Than Mine”. Both seem like they would be natural fits for his vocal style. Thanks for this review, Trigger. Sons of Bill is our local country band and I’m pleased they’re getting the recognition they deserve. You won’t find a more talented or professional group. Between Sons of Bill and Karen Jonas, I appreciate the favorable attention you’ve given our area this year. These guys are the best. Saw them live this summer. Virginia calling is one of the most soulful songs. I’m very proud of these hometown heroes.